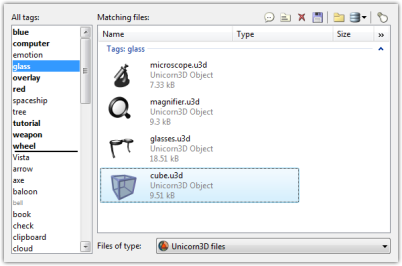 The Tagged storage provides an alternative way of storing and retrieving files created in RealWorld Designer applications. Instead of putting them into folders, the files are stored in database and associated with any number of tags. The storage can be accessed in all relevant open or save dialogs. Tabs at the top of these windows allow you to choose between normal file system and the tagged storage. Any number of tags can be attached to each file. Multiple files with same name can be stored in the tagged storage and arbitrary text notes can be attached to each file. When opening files, activate tags by clicking them in the All tags box. Files matching the activated tags are displayed in the file list box. Double-click a file to open it. When saving a file, specify its filename and tags and click OK or press Enter. If a file is selected in the list of files and the "Create new revision" box is not checked, the selected file will be overwritten. Otherwise a new file will be created. When to use tagged storage? The tagged storage was designed specially for users, who create a lot of files, use them in different projects, often modify them and want to keep multiple revisions of each file and still find files related to a project or by topic. If you fall into this category, definitely give the tagged storage a chance. Files can be moved between the tagged storage and file system using drag and drop method. The files in tagged storage are stored in a database on the local file system. The database can be backed up, restored, and merged. Merging two databases can be used to cooperate on larger projects. The restoration function allows merging content of two databases based on file modification dates. como faz para usar a seta que eu criei ?